For some, couponing conjures up visions of hours spent poring over newspaper circulars and cutting up small pieces of paper just to save a few bucks at the checkout counter. But couponing wouldn't be so popular if it were just about saving a dollar or two every week. Billions of coupons are redeemed every year, as proactive shoppers have learned the art — and fun — of nabbing discounts before they shop. Let the savviness of veteran couponers wear off on you and you can save a bundle. And you’d get bragging rights: You too could claim you paid next to nothing for $50 worth of items at the local drugstore thanks to couponing. Making a serious effort to save money with coupons can be overwhelming at first. Where do you begin? Does it make sense to pay $5 for the Sunday paper just for the circulars? And how can you actually stay organized so you don’t forget to use a lucrative coupon and avoid coming across as a messy deal-chaser at the cash register? We have the answers in our guide for 10 ways to realize the most savings from your couponing. Newspaper inserts are still the tried-and-true way of gathering coupons — and as long as you’re a big fan of big-name brands at the grocery store (including Procter & Gamble products), the price of the paper is worth it. In 2013, 41% of redeemed coupons came from inserts — those colorful folded sheets of paper that call on you to cut out some boxes and save some dough. The manufacturers behind these coupons have wised up to the fact that not everyone reads the paper, so they also offer digital versions (but you have to do some searching to get your hands on them). You can go to the websites of your favorite brands to look for and print new coupons, or sign up to get them sent to your inbox. Also look at websites that aggregate all the latest coupons and deals in one spot, search for mobile apps that will keep you updated with deals, and see if your favorite store takes the eCoupon (a coupon you download onto your loyalty card for savings). You’ll also want to go online to get the latest circulars from your local stores (or, again, get them with your newspaper) to see what coupons or sale items they’re offering each week. This is where coupons become super fun and potentially lucrative: Whenever you can “stack” a manufacturer’s coupon with a retailer’s coupon or discount, you’ll get a huge deal. In some cases, you can end up paying close to nothing for that item. Here’s what makes some couponers stand out from the rest: organization. It’s really easy once you get yourself set up. The secret to pulling it off is to clip only the coupons you may possibly use. Sounds like a no-brainer, right? But you may be tempted at first to just cut out every coupon you see and stuff them in a box. But why bother with coupons you’ll never redeem? Do some thinking ahead of time, while you’re going through the inserts each week, and you’ll come out a saver in the end — of both money and your time. Put the coupons aside by date, store, or product — whatever works for you. The key is to make sure you can easily find them again and that you’ll be able to keep a close watch on those expiration dates. You could do this by getting file boxes and labeling each sleeve. Or get a photo album and put your coupons in the sleeves where you can easily flip through them and see them. The cheapest, and perhaps easiest, way to get organized is to embrace the envelope method. 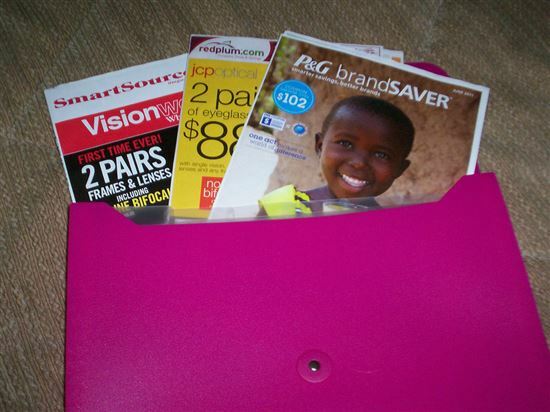 With this strategy, you organize your coupons by store. Find a coupon for Target, for example, and it immediately goes into your Target envelope. You can also use the envelope method to organize by product type or manufacturer. You’ve laid the groundwork: You have a tidy stash of coupons and you know where to get discounts. Now you need a strategy that you can stick to every week. Grabbing a handful of random coupons and hoping for the best while you do your weekly food shopping isn’t going to yield the savings you’ll need to make all that clipping worthwhile. Plan which stores you are going to hit and know the policies in terms of how many coupons you can use. Some stores don’t let you combine multiple coupons for one purchase, while others will. Get familiar with the policies of your go-to stores, and you’ll be ready for the next step. 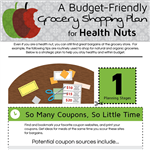 Out with the old and in with the new applies to meal planning when you are couponing. Forget about coming up with a month’s worth of meals in advance. The best way to save a ton with coupons is to plan your meals for the week when the flyers come out on Thursday or Friday, depending on where you live. Armed with that knowledge, sit down and plan meals based on the coupons you have and the deals being offered. Plan around items that are on sale and have a coupon. Let’s say your local grocery store has a sale on chicken breasts and you have a manufacturer coupon for that brand of chicken. Now you’ve got at least one night’s dinner planned already. Better yet, plan to buy more than one package to freeze and you’ve got another night planned as well. Timing your purchases is key to saving money. To get the most bang for your buck, buy things when they go on sale. Try to hold on to coupons until the product goes on sale, but always be cautious of expiration dates. All those stories you hear about people paying next to nothing for their purchases is typically because they timed what they were buying just right. Being diligent and willing to go to more than one store to take advantage of a sale can pay off. Some stores will let you double coupons, usually up to a certain value. Let’s say the store allows you to double coupons up to 99 cents. That means any coupon valued at 99 cents or below would be doubled (shaving $1.98 off your bill). Some stores will only allow coupon doubling on certain days or they’ll limit how many coupons you can double on a certain item, so this is another reason to know the store policies. Stockpiling is another tenant of couponing, but this one can get you in trouble if you aren't careful. When you can stack deals (combining a manufacturer coupon with a store discount) or use as many coupons as a retailer allows, you’ll want to get as many products as you can get your hands on (some stores limit how many on-sale items you can buy). This is why some couponers end up with basements lined with so many products it looks like they could open their own grocery store. This strategy can work if you’re careful with your stock and stick to items you and your family will consume before they expire. You don’t want to stockpile something that will go bad or will sit in your basement for years collecting dust. Armed with all your coupons and couponing know-how, it’s now time to hit the stores. This is where the planning and organization will really come in handy. Don’t leave your house without a list, the coupons you want to use, and a plan for which stores you’ll be visiting. Consider whether the cost of travel from one store to another will make a big dent in the savings you’re chasing; if you have to go through four towns for your second supermarket, the multiple store strategy may not make sense for you. Make sure your coupons are organized and easy to access to avoid any sighs in the checkout line (either by the person behind you or from you, out of shopping fatigue). Starting out, it’s a good idea to learn how to save at one store instead of trying to save money at multiple stores. Taking on too much will quickly turn a fun hobby into a stressful endeavor. It’s also important to set limits as to how much time and effort you want to commit to couponing. If you find it’s taking more and more time or you are getting obsessed with saving money, it’s time to chill out. Couponing is a great way to save money, but it’s also supposed to be fun, so make sure to keep it that way! Let's face it. Saving money with coupons can be thrilling. But let your couponing go awry, and you'll be down in the dumps when you realize you've wasted time, effort, and — perhaps worst of all — possibly money you shouldn't have spent. Make the most of your coupons by first understanding the common mistakes people make. We have 23 mistakes that are preventing couponers from getting the most savings. 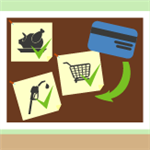 Share on Facebook "Beginner's Guide to Couponing"